cDepartment of Neuroradiology (B.J.K. ), Kwandong University College of Medicine, Myongji Hospital, Goyang, Korea. BACKGROUND AND PURPOSE: IV FDCT angiography is an emerging technology for the detection of intracranial vascular disease. This study was conducted to determine the feasibility of IV FDCT in estimating major atherosclerotic intracranial arterial stenosis with DSA as the reference. MATERIALS AND METHODS: DSA and IV FDCT were performed simultaneously in patients with transient ischemic attack or acute cerebral infarction. The degree and length of stenosis were measured. The stenotic vessels were categorized into 4 groups by the grade of stenosis: normal (<30%), mild (30%–49%), moderate (50%–69%), or severe (>70%). The vessels of the normal group were excluded from analysis to reduce spectrum bias. Measurement of vessels was recorded by using an electric ruler by a qualified endovascular neurosurgeon and a neuroradiologist. RESULTS: Eight hundred forty-two vessel segments in 69 patients were calculated. Mild (n = 56), moderate (n = 47) and severe stenosis (n = 46) groups were analyzed. IV FDCT had a sensitivity of 97.6%, specificity of 96.9%, and negative predictive value of 96.9% for detecting ≥50% stenosis and respective values of 91.9%, 98.2%, and 97.4% for depicting ≥70% stenosis. The difference of stenotic length between the 2 tests was not significant as an increase in the severity of stenosis (Spearman rank correlation test; r = −0.12, P = .13). CONCLUSIONS: IV FDCT can be a feasible alternative as a noninvasive method for evaluating stenosis of the major intracranial arteries. Recently, IV FDCT has been shown to have a high resolution that is similar to that of multidetector row CT angiography4 and has been suggested as an alternative tool for evaluating acute cerebral ischemia.5 Many trials have been conducted to investigate the accuracy of each noninvasive test compared with cerebral angiography, but to the best of our knowledge, no study has directly compared the degree and length of intracranial arterial stenosis between DSA and IV FDCT. This study was undertaken to evaluate the feasibility of IV FDCT in estimating atherosclerotic stenosis severity and the length of the major intracranial arteries with DSA as the reference standard. This study was approved by the local ethics committee. This prospective analysis was performed in patients who concurrently had undergone DSA and IV FDCT from January 2009 to December 2011 at a single center. Patients with TIA or acute cerebral ischemia were included. 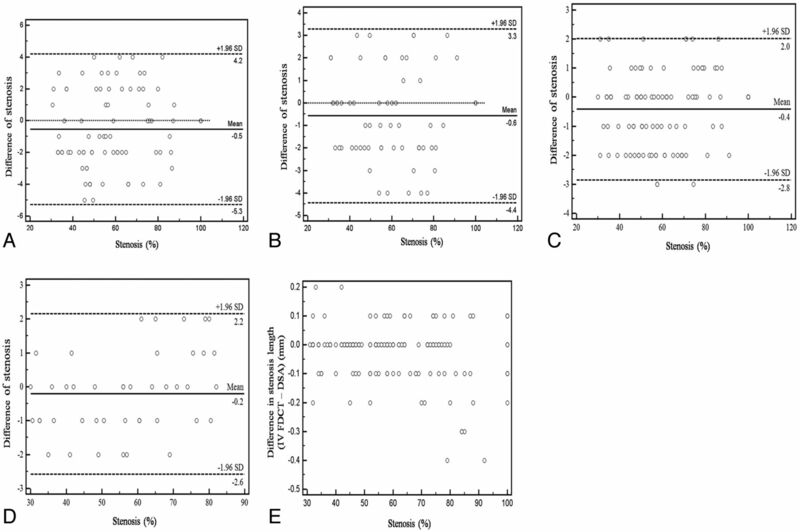 Eight hundred forty-two vessel segments in 69 patients were measured. After checking routine conventional angiography, 3D rotational angiography was performed in cases of vascular stenosis, and additional studies were performed with the guidance of a working projection of 3D angiography. IV FDCT was conducted simultaneously. Maximum-intensity-projection images obtained by IV FDCT were rotated and reconstructed for the same working views. In difficult cases that were not reconstructed from IV FDCT data, anterior and lateral projection images of DSA were matched with coronal and sagittal directional images of IV FDCT, respectively, for analysis. Every vessel diameter, the degree of stenosis, and stenosis length were recorded by using an electric ruler by a qualified endovascular neurosurgeon and a neuroradiologist blinded to clinical information. The vessel diameter of the bilateral supraclinoid internal carotid artery, A1, M1, M2, P1, and V4, which was located just proximal to the posterior inferior cerebellar artery and the midpoint of the basilar artery, was measured. Percentage stenosis was determined as [(1 − (D-stenosis/D-normal)] × 100, where D-stenosis was the most severe stenosis and D-normal was the diameter of proximal normal artery. The formula was used for measuring the degree of stenosis.6 The locations of stenotic segments were divided by direction (horizontal versus vertical) and circulation (anterior versus posterior). Horizontal directional components comprised A1, M1, and P1, and anterior circulation comprised ICA, A1, M1, and M2. Lesion length was defined as the distance from proximal to distal of stenotic vessel. Eighty milliliters of Pamiray 250 contrast agent (iopamidol; Dongkook Pharmaceutical, Seoul, Korea) mixed with 40 mL of saline was injected through an anterior cubital vein with a flow rate of 5 mL/s. IV FDCT parameters were 0.4 increment, 220° total angle, 538 total projections, and radiation dose of 35 mGy (manufacturer's information) with an acquisition time of a 20-second rotation and an 18-second x-ray time delay. Postprocessing of the IV FDCT data was conducted on a Leonardo DynaCT dedicated workstation equipped with InSpace 3D software (Siemens, Erlangen, Germany). The images given as maximum-intensity-projection images in the axial, coronal, and sagittal planes with various section thicknesses, mainly 15 mm, were reconstructed for analysis. An electronic ruler was used for estimating stenosis rate and length. Every IV FDCT and DSA were conducted with the Axiom Artis zee Biplane system (Siemens). Intraclass correlation, sensitivity, specificity, positive and negative predictive values, 95% CIs, Bland-Altman analysis test, and a Spearman rank correlation test were used to assess the reliability of IV FDCT compared with DSA. Statistics were performed with the Statistical Package for the Social Sciences, Version 12 (SPSS, Chicago, Illinois) and MedCalc (www.medcalc.org). Sixty-nine patients with 842 vessel segments were included. Their mean age was 59.1 years (range, 36–85 years), and 31 patients were male (44.9%). The distribution of stenotic vessel segments is shown in Table 1. The intraclass correlation for measuring ≥30% stenosis was 0.98 (95% CI, 0.97–0.99). IV FDCT had a sensitivity of 97.6% (95% CI, 91.7%–99.7%), a specificity of 96.9% (95% CI, 89.3%–99.6%), and a negative predictive value of 96.9% (95% CI, 89.3%–99.6%) for detecting ≥50% stenosis with DSA as the reference. For identification of ≥70% stenosis, IV FDCT had a sensitivity of 91.9% (95% CI, 78.1%–98.3%), specificity of 98.2% (95% CI, 93.7%–99.8%), and negative predictive value of 97.4% (95% CI, 92.4%–99.5%) (Table 2). Bland-Altman plots showed good agreement between IV FDCT and DSA in both directions (horizontal versus vertical; Fig 1A, -B) and circulations (anterior versus posterior; Fig 1C, -D) in assessing the degree of stenosis. No tendency of over- or underestimation was found in the different stenotic groups. Bland-Altman plot shows excellent depiction of intracranial stenosis of the horizontal segments (A), vertical segments (B), anterior circulation (C), and posterior circulation (D) by IV FDCT with DSA as the reference. Length discrepancy (IV FDCT–DSA, in millimeters) was found more often in higher stenosis but was not statistically significant (E, Spearman rank correlation test; r = − 0.12, P = .13). Mean stenosis length was 6.92 ± 2.2 mm in IV FDCT and 6.95 ± 2.2 in DSA. The difference of stenotic length between the 2 tests (IV FDCT and DSA, in millimeters) was not significantly different as an increase in the stenosis severity (Spearman rank correlation test, r = −0.12; P = .13; 95% CI, −0.28–0.04) (Fig 1E). Hirai et al12 reported that the combination of MRA with CTA can improve sensitivity and specificity to 100% and 99%, respectively, for detecting stenosis of ≥50, but it is not a fully available procedure, considering its high cost and procedure time. The SONIA trial13 revealed that high negative predictive values of the tests to exclude high-grade intracranial stenosis (>70%) can be obtained with the combination of transcranial Doppler with MRA. Although the SONIA trial was a multicenter study and provided test cut-points when evaluating stenosis, the accuracy of transcranial Doppler sonography has been dependent on the operator's expertise14 and the results of transcranial Doppler sonography can vary among institutions. IV FDCT is a novel technology for generating CT-like images from a biplane angiographic system. The distinctive feature of IV FDCT is its use in the neurointerventional setting without the need for patient transfer. Because the treatment of acute cerebral ischemia has a therapeutic time window, within 4.5 hours for intravenous thrombolysis15 or 6 hours for intra-arterial thrombolysis,16 it is crucial to shorten the time from the onset of symptoms to diagnosis and treatment for good clinical results.17 Therefore, in particular, patients who present with acute ischemic stroke may benefit from early detection with IV FDCT and instant endovascular treatment.5 In addition, IV FDCT allows the prompt detection of periprocedural complications. Consequently, operators can perform the endovascular intervention with more certainty and safety. Images from IV FDCT can help set the revascularization treatment plan by providing valuable information on the accurate stenotic area, stenotic grade, and collateral circulation in the same acquisition, contrary to DSA.18 Blanc et al19 demonstrated the reliability of IV FDCT for assessing occlusion level, clot length, collateral degree, and patency of anterior and posterior communicating arteries. Although there is no statistic regarding the circumferential calcification in major intracranial arteries and distal arterial stenosis through a comparative study with CTA in this investigation, IV FDCT may clearly depict the vascular lumen with circumferential calcification and distal stenosis with lesser superimposition of bone and venous structures (Fig 2). 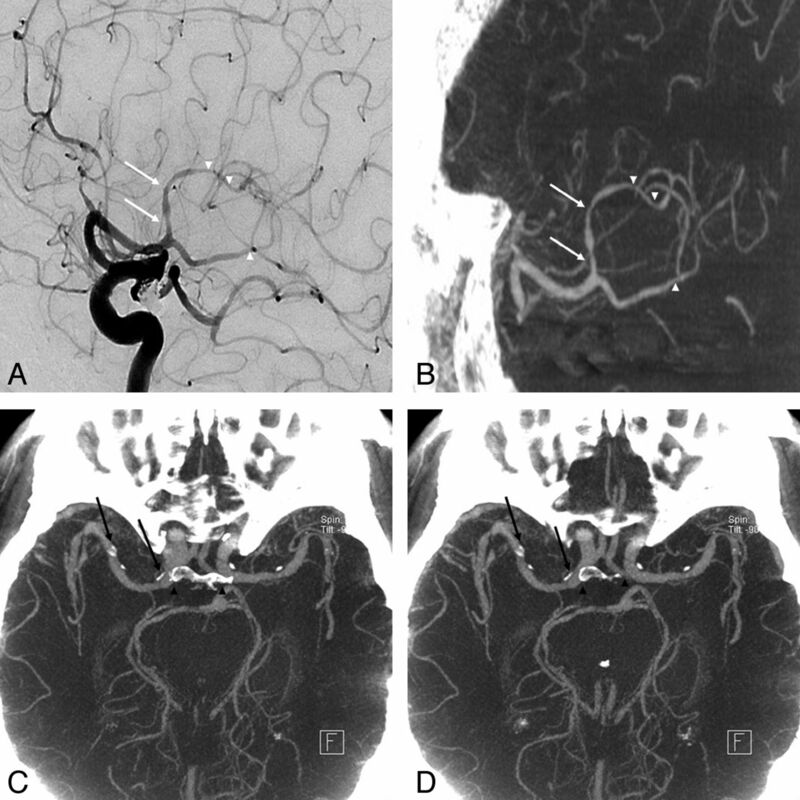 An 81-year-old woman who underwent coil embolization of an unruptured posterior communicating artery aneurysm 1 month before was referred due to a history of progressive left hemiparesis. A and B, Good concordance was obtained for depicting stenosis at the proximal (arrows) and distal (arrowheads) M2 segment between DSA and IV FDCT. C and D, Axial maximum-intensity-projection image of IV FDCT allows a clear delineation of the vascular lumen from circumferential calcification (arrows) without superimposition of bone (arrowheads). A 70-year-old woman was transferred for right-sided hemiparesis. A, Anteroposterior DSA of the left internal carotid artery shows severe stenosis (76.2%) at the left M1 segment (D-stenosis) with the beginning point of M1 (D-normal) as a reference point. B, Selective maximum-intensity-projection image of IV FDCT reveals excellent concordance of severe stenosis (76.9%) at the left M1 segment (arrows) with DSA as a reference. A 55-year-old man was transferred to the emergency department for right-sided hemiparesis. A, Time-of-flight MRA reveals severe stenosis at the left M1 segment (arrow). B, Selective maximum-intensity-projection image of IV FDCT shows 40% stenosis at the left M1 segment (arrow) with excellent concordance to the DSA reference. C, Anteroposterior DSA of the left internal carotid artery illustrates 40% stenosis at the left M1 segment (arrow). IV FDCT has some drawbacks including more motion artifacts and beam-hardening artifacts due to metal. Beam-hardening artifacts can be reduced by using a metal artifacts-reduction algorithm.27 The method for reducing motion artifacts due to metal must be studied further. Several reports have described good correlation between IV FDCT and DSA or CTA.4,28,29 However, no objective data analysis has been performed on the reliability of IV FDCT with DSA as a reference. Furthermore, previous studies compared stenotic lesions using different radiologic methods within 30 days. In our investigation, statistical analysis was used for a comparison of IV FDCT and DSA in assessing the stenotic ratio and length. Moreover, the 2 tests were performed simultaneously. Therefore, there is no chance for aggravation of stenosis during the interval time. There are some shortcomings in this study. First, it was not a randomized controlled study. Second, direct comparison with IV FDCT and other noninvasive methods, including MRA or CTA, was not performed. Third, no statistical analyses were performed on circumferential calcification or distal stenosis between CTA and IV FDCT. IV FDCT can be a reliable alternative noninvasive test for evaluating atherosclerotic stenosis of the major intracranial arteries. Further investigation on the accuracy of IV FDCT with direct comparison with MRA or CTA is needed. Accepted after revision April 16, 2012.